The Santiago is a men's sock that uses a cotton/linen blend to make a cool, lightweight, luxurious summer sock in classic colours. Part of Pantherella's Summer Collection, this innovative range of socks is quickly becoming a Pantherella favourite with our loyal customers. 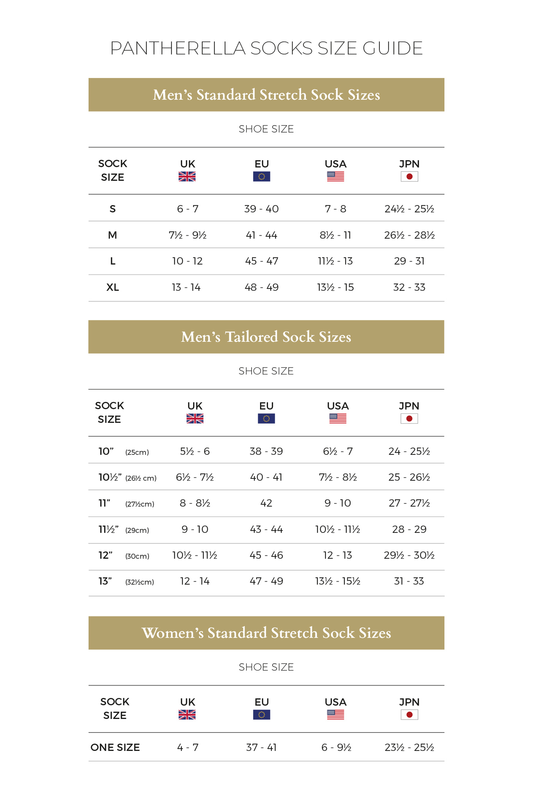 Buy your Pantherella dress socks directly from the factory in England. Delivery to the USA with NO DUTY & NO TAX to pay. Our Cotton-Linen socks are knitted from a blend of compact spun, soft Egyptian Cotton, twisted with a high percentage of ecru linen. Pantherella Cotton-Linen blend socks feel cool on the feet, are highly durable and resistant to pilling. The Egyptian Cotton Pantherella use for knitting our socks has a count of 2/38 NE– this number translates as the thickness and weight of the yarn. Pantherella Cotton-Linen Socks are knitted on a 176 needle, fine-gauge machine. Aesthetically pleasing, cool feeling, summer socks. What is a Cotton-Linen blend? Our socks are knitted from an innovative cotton linen blend which combines ‘zero’ spun cotton, with natural ecru linen. ‘Zero’ spun cotton is a rounded, clean yarn which uses technical advances in spinning to eliminate every trace of bobbling in the fibre resulting in longer wear and superior comfort. Linen is laborious to manufacture, but the fibre is very absorbent and garments made of linen are valued for their exceptional coolness and freshness in hot weather. When combined, these yarns give a unique two-colour mouline effect which is knitted into the perfect leisure socks for the warmer Spring/Summer months. $15.00 - Your order will be delivered directly from the UK to your door, usually within 2-5 working days via UPS.